While Phil and I both have/had blue WRX's you never see to much of them on here. I guess when you DD something you start to think its not that special, you take it for granted, while others still worship it. I supposed this is why you don't see too many pictures of our suby's on here. We see them everyday so it's hard to see why others would want to look at pictures of them. While I sold this Subaru about a year ago, I took some farewell pictures, thinking to myself in about a year I'll want these, and now I know why, its to share it with you guys. So click read more for a little lesson on sold cars from a true car nut. 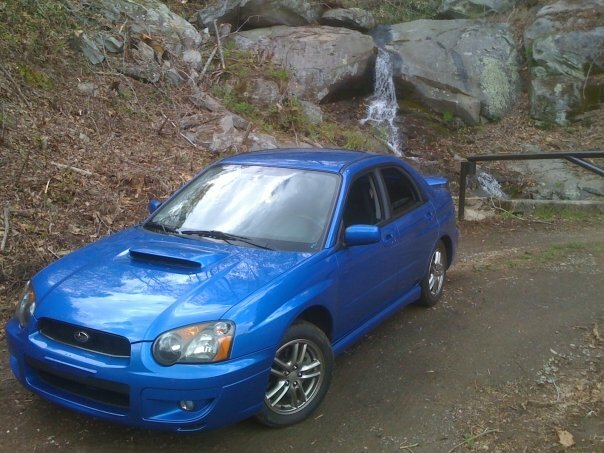 So I had this suby for about 4 years, a blob eye as they call it, and it was as Subaru'y as they come. WRC blue, premium interior (means black STi seats, steering wheel etc..) and in the body that Subaru won the 2003 WRC Championship in with Petter Solberg. You can't ask for a more special Subaru car than this besides Colin Mcrae's own 555 Impreza. So as you could see when I bought this car I loved it. I really did, I in fact broke up with a girl just cause she put a scratch on it, true story bro. First things first I lowered it on Cobb tuning everything, didn't slam it like the high schoolers do today, just dropped it a tad for better handling. Then came the exhaust, the intake and the Cobb accessport. The accessport was the best thing I ever bought for this car, if you have one I highly recommend it! Wheels came at some point because the 16's just didn't cut it. I rolled on these rota's until the day I sold it. They were great wheels, I got them for cheap, and they were gold so they fit the bill. 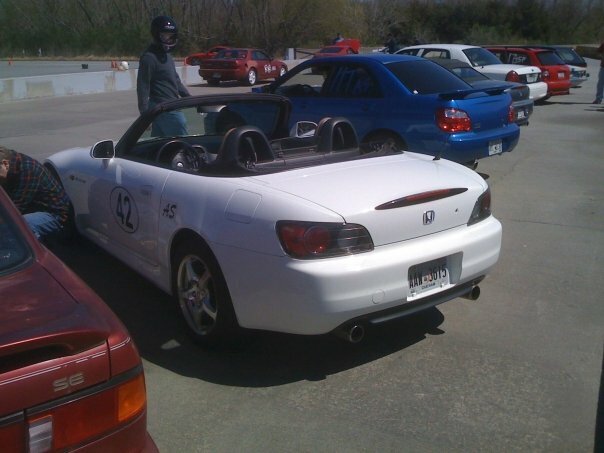 Of course I took it to a few autox's like every good Subaru owner does but the more that I drove at autox's the more I wanted to go further Autox's were the gateway drug for me, I wanted more seat time, and to best honest I really wanted to rally. 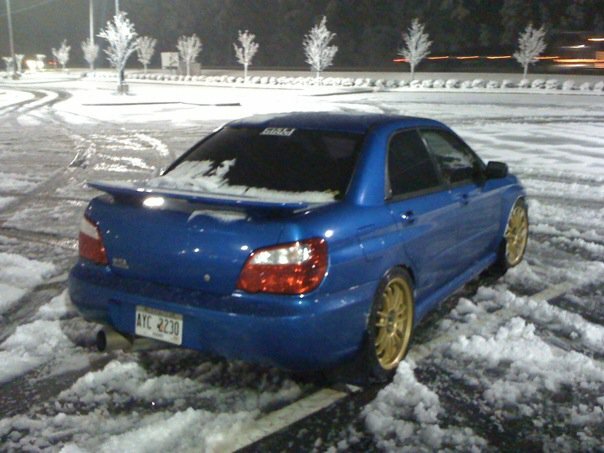 It comes to a point in every Subaru owners life were they have to make the call to either ruin the car or keep it nice. I wanted to ruin it. I really tried to get into the rally scene, I even volunteered at a few events to get the feel of things, but it feels like there is no rally scene in the south. 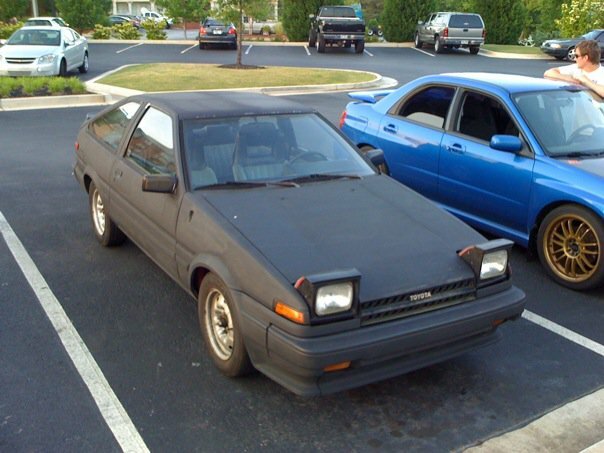 There are two events in the south, and a few rally x's in different states but nothing to really build a good car for. So DD status it stayed, and I got into other things. As expected in four years I had some pretty insane times with this car. A couple of weekends at the Tail of the Dragon, where I set the brakes on fire (like smoke pouring out of the wheels on fire) some hairy adventures when it snowed, and all the DD shenanigans you would expect of someone like me. It saved my life many times, even though I pounded on it 24/7 it never needed any work besides a powersteering pump after doing about 100 donuts in the parking lot you see below. Realizing this was fun, drifting pop'd into my head. As the rest they say is history. The suby was there when I first picked up the 86 and then the 240. Of course the suby was there when this site really started to kick off, and Phil made the hilarious picture below. Lol good times. Im pretty sure Phil was so impressed with my suby he went out and bought his own, which he still drives today. But here is where I wanted to address the elephant in the room. Why did I sell it? How could I sell a future classic? How do I feel now? Well I sold it because I already had two other racecars and I needed something different. Yes it is a future classic but it wasn't an STi, had it been an STi Id probably still have it today. Which is a point I wanted to make here. The best lesson I learned trough this car was always buy the best model. Everybody on the planets first question was "why didnt I buy an STi?" and really at the time it was cheaper than an STi but had I known this then I would have saved some more cash. I am happy to report that since then I have used the lesson wisely with the Rubicon and the 86 which is an original GTS. Buy the top model, you will thank yourself later on. How do I feel now? Well I'm happy to report back that I'm still loving the new Jeep and with Scrap Metal (LSVert) and Betty white (86) I have plenty of things to keep my attention off the slow, almost sloth like speeds of the Jeep. Also knowing that one day I can go out there and source an STi of the same year if I really need to, makes me feel better. For now I'm as happy as they come, and I just really hope the Suby and his new owner are doing well and wreck free! I'm sure its out there somewhere with a really short skirt in the passenger seat and a smile in the drivers. Till next time stay friv!! Makes me a bit sad, really. Only serves to remind me of when I let go of my Genesis Coupe for an A3. Never. Again. It's a bad day when you wake up and realize that your baby just isn't needed or cutting the muster anymore.